Alternatively, if you have your own car or are renting one, just park out front and come on in. Then choose from a range of transport options (bullet train, regular train, coach) for various routes to Omachi, as outlined below. If you will be taking the bullet train, the only 2 stations to board are Ueno Station and Tokyo Station. We would recommend Tokyo station as it is far more aesthetic, very historic, and in a great vicinity if you have a spare couple of hours for sightseeing. It's only 6 minutes further travel beyond Ueno, so might as well stay on and alight at Tokyo Station. 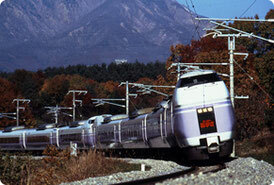 Then get your bullet train tickets to Nagano City and board. The Chuo line train can be boarded at both Tokyo Station and Shinjuku. Tokyo is closest when coming from the Keisei lines. 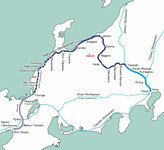 The Hokuriku Shinkansen is a shinkansen line that connects Tokyo with Toyama- Kanazawa, via Nagano City. Chuo line; Tokyo (Shinjuku) to Matsumoto. 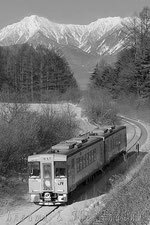 Azusa and Super Azusa trains. Train from Matsumoto Station to Omachi Station (59 minutes). Simple local carriage. 3. Coach from the new Shinjuku Station, all the way to Omachi. (Total cost about 4500 yen, Total time about 4.5 hours.) Check these timetables for ALPICO bus and KEIO bus. There may be occasions where guests want to mix options 2 and 3, by transferring from train to coach or vice versa at Matsumoto, which is easy to do as the train and coach stations are less than a minute away walking, as shown below. Be sure to read this page in conjunction with more transport information at our Travel In Japan section. We repeat here that we highly recommend the handy and reliable Hyperdia route and schedule planner for planning any rail journey in Japan.